I had so much fun Saturday night! We went and saw "Kong:Skull Island". What a good show! The movie gets to the point right away. You meet Kong after USA and Japanese pilots crash during a dogfight. The American is played by John C. Reilly when he gets older. From there on out the plot is quick and so is the character development. You meet Bill Randa who organizes the expedition played by John Goodman, Preston Packard the military leader played by Samuel L. Jackson, Tom Hiddleson as James Conrad the scout and Brie Larson as the photographer Mason Weaver. They all do a great job, along with the other actors in more supporting roles. The CGI is seamless. The cinematography is beautiful. 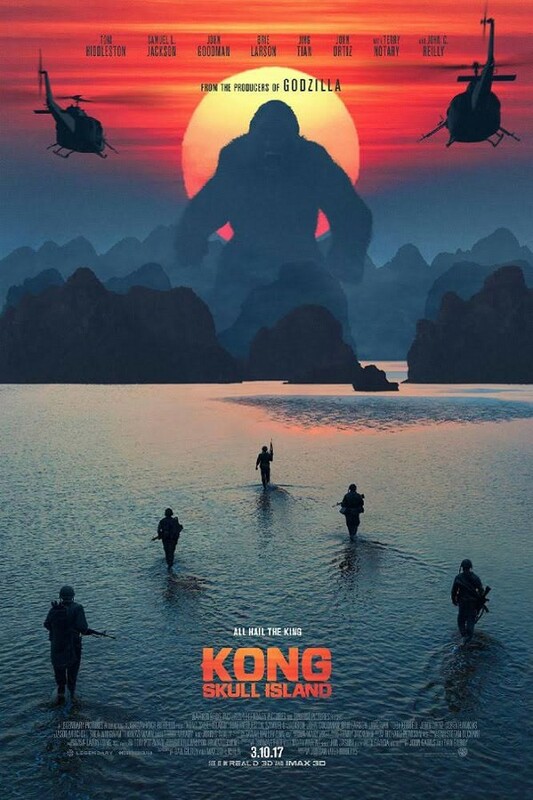 It is not a regular King Kong movie. He doesn't fall in love with the photographer. He also doesn't die in the end. This is not a spoiler because it has been announced that Kong will be fighting Godzilla in the next movie. That is also why he is so much bigger than in previous movies. Oh yeah, stay through the credits. There's another scene at the very end. So go. Have fun. Eat popcorn.